HIRING DJS & HOSTS - BE PART OF THE VENUE FAMILY! Now HIRING Hosts & DJs! All Genres Welcome! 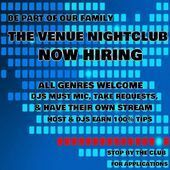 Hiring Hosts & DJs @ The Venue Nightclub! 100% Tips / All Genres Welcome! We Want You! Apply Today!